Hey, all! I have some cool things coming your way in February, so make sure that you are checking back every day. I appreciate you for reading. As days go by, I do get into funks. Sometimes I’ll read three…four…five graphic novels that I have a hard time getting into. As you may know, I don’t review everything I read. If I really don’t like it, I don’t review it. I want to showcase the stuff that I enjoy, and some people might say that negative reviews are part of the process, I do agree, but you will not find a completely negative review from me in this 365. But when I hit a run of books that I do not like, it’s hard. Sometimes I think I’m hitting a wall. Getting tired of reading graphic novels, at least for a bit. 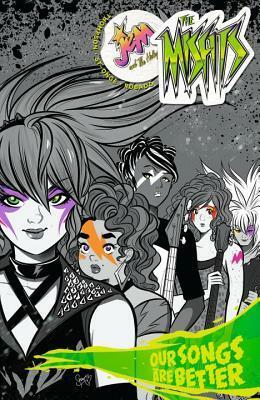 Then, I pick up a book like Jem And The Holograms: The Misfits. Thank you Kelly Thompson for writing such a cool book that brought me out of a mini-funk! I love this book. It has heart. It has character. It has personality. For while the writing of Thompson is fantastic, it is the art and coloring of St-Onge and Robado that make this book so aesthetically pleasing. The art and colors are darker and more pronounced than the whimsy of a traditional Jem book, but we’d expect nothing else from The Misfits. St-Onge’s way of capturing character’s expressions is top-notch, as good as any book I’ve reviewed in my 365-day quest thus far. And when Thompson gives us heartbreaking backstories of the characters, St-Onge’s art elevates the emotional output of this book. And Robado with the coloring?? Come on…the coloring is dope! There is something special about taking a fairly simple (yet amazing) drawing and adding the right complexity of color to enhance the page. Look, this creative team is good. I’d take them into a comics battle! Another one of the things making this book stellar is the collection of personal issues that each band member is going through and how they stick by each other through rough times. I guess you could make the argument that the amount of problems that the girls have is overload, but I dig it. Each problem speaks to a different issue that teens could face, and it’s written so well that I welcomed the backstories and vulnerability given to us as readers. I think kids will find themselves in this book, and some will find solace in how the problems are address and handled…kudos to Thompson for that!